College debt pushes retirement age for today’s college graduates to 73. Having to spend “the first ten years (or more) of their careers paying off their hefty loans” will mean a postponed retirement for “debt-straddled” college graduates. With the total amount of outstanding student debt approaching $1 trillion, the plight of debt-straddled college students is more important than ever. In the past 30 years, not only has the number of high school graduates enrolled in four-year universities increased by 11%, but college tuition has also soared over 200%. As more students attend college at a cost higher than ever before, Millennials have increasingly turned to loans to help finance their education. While much of the college debt dialogue is over immediate issues like employment and repayment, there is another glaring challenge that graduates will have to deal with for years to come: retirement. When will students be able to retire given that many are spending the first ten years (or more) of their careers paying off their hefty loans? NerdWallet conducted a study that examined the financial profile of a typical college graduate and found that while retirement is certainly not impossible, for most it will have to wait until their early to mid 70s— over 10 years later than the current average retirement age of 61. Clearly, student debt has an impact on retirement outcomes. Currently, the average retirement age is 61. But for most of today’s college grads, the realistic retirement age will be closer to their mid-70s. Given an average life expectancy of 84, this will leave only 10-12 years for people to spend in retirement. The main reason for this is that although the median college graduate leaves with a seemingly manageable $23,300 debt load, 7% of a student’s earnings go toward yearly loan payments of $2,858 for the first ten years of his or her career. This prevents any meaningful contributions toward retirement. In fact, by the age of 33, when the typical college grad has finally paid off their standard 10-year loans, he or she can only be expected to have saved $2,466 for retirement—over $30,000 less than if the student had graduated with no debt. Even worse, the foregone savings carry a serious opportunity cost, as this money would have been earning a compounded rate of return every year until retirement. At the projected retirement age of 73, the lost savings directly attributable to student debt is $115,096, nearly 28% of total retirement savings. 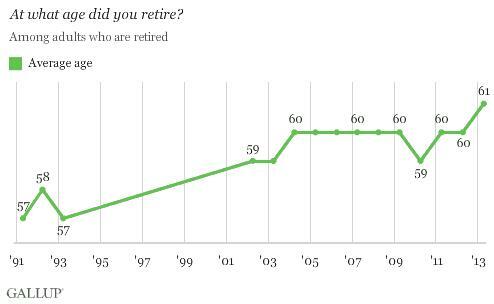 Average retirement age is on the upswing. College debt just exacerbates the trend for some people. The college wage premium may not offset lost retirement savings. On average, the college wage premium may offset the lost retirement savings caused by paying down student debt. But on an individual basis, results may vary. Any boost in income related to a college degree is highly dependent on the field of study and the student’s ability. For example, how much of a wage premium will the C-average, ethnic studies college graduate actually receive?